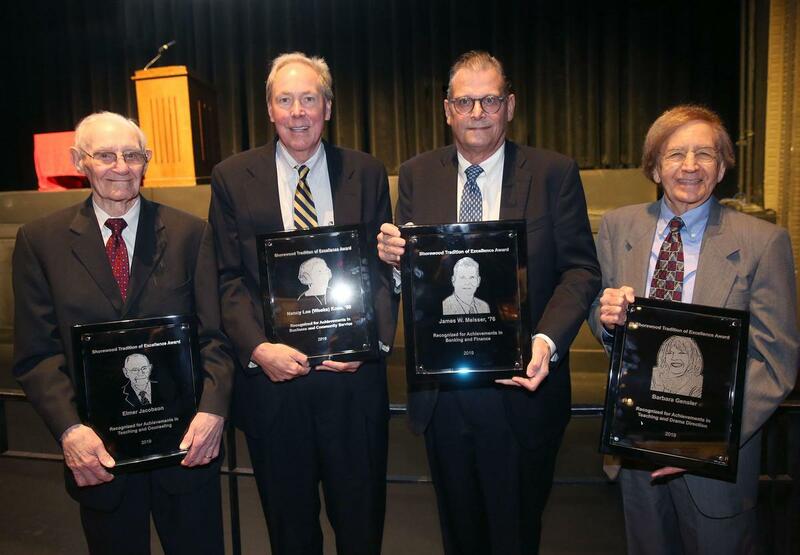 The Shorewood School District honored distinguished alumni and former staff for their achievements and service to their communities at the Shorewood Tradition of Excellence Awards Day on April 12, 2019. Shorewood alumni Nancy Lee (Weeks) Koss (Class of 1950) and James W. Meisser (Class of 1976), and former staff members Barbara Gensler and Elmer Jacobson were recognized during a special day-long event at Shorewood High School on April 12, 2019, which included an awards ceremony at an assembly for all students, a luncheon, and a reception sponsored by the Shorewood High School Alumni Association. Photos from the event can be seen here. Established in the year 2000, the Tradition of Excellence Awards are bestowed upon Shorewood High School graduates and staff who have distinguished themselves in a diverse range of areas, including community and public service; science, engineering, and technology; medicine and public health; the arts and humanities; business; government and political service; education; military service; philanthropy; and other professions committed to serving others. Previous honorees include Chief Justice William Rehnquist, U.S. Congressman and Secretary of Defense Les Aspin, and Rock ‘n Roll Hall of Famer Jerry Harrison, among others. Barbara Gensler served as Drama Director at Shorewood High School for 47 years. Beloved among students and teachers alike, Mrs. Gensler is remembered as a passionate, dedicated, and inspiring teacher. Her role in shaping and establishing the high level of excellence in Shorewood theater productions is legendary. She began teaching English, drama and speech at Shorewood in 1965. As Shorewood's Drama Director, she directed more than 125 productions at SHS, and served as Chair of the Performing Arts Department. When she retired in 2012, the Shorewood auditorium was renamed the Barbara Gensler Theater in her honor, and graduates from across the country returned to Shorewood to celebrate her career at a special event organized by the Shorewood Alumni Association. Many former students of Mrs. Gensler who participated in theater productions at Shorewood over her 47-year career have cited the incredible influence she had in shaping their lives and careers. Shorewood graduates who were mentees of Mrs. Gensler have gone on to have successful careers in theater, film, music, and entertainment, including filmmakers David and Jerry Zucker, Rock ‘n Roll Hall of Famer Jerry Harrison, and Broadway star Kate Baldwin. Barbara Gensler passed away on January 30, 2017, and the Barbara Gensler Theater Arts Scholarship was established to honor her memory. Her Shorewood Tradition of Excellence Award will be accepted by her husband, Jim Gensler. Elmer Jacobson was a teacher, counselor, coach, and faculty leader for 35 years at Shorewood High School. He was born in Green Bay, Wisconsin on August 8, 1927. He graduated from Green Bay West High School in June of 1945. He was drafted into the U.S. Army in October of 1945. He served in the Army separation centers until December 1946. He enrolled at University of Wisconsin-Madison in September 1948 and married in September of 1951. He graduated from UW-Madison in June 1952, and went on to teach at Oostburg High School from September 1952 until June 1954. Mr. Jacobson came to Shorewood High School in September 1954. He taught biology and also served as football coach. After earning his masters degree from UW-Madison in 1962, he transitioned into the role of guidance counselor at Shorewood, as the counseling staff was growing at the time to respond to the increased need for college/career planning and student support throughout the high school years. Mr. Jacobson worked directly with students and families on the full range of school services. He was Director of the Guidance Department for nearly two decades, developing and sustaining the counseling center into a welcoming and student-centered place. He was instrumental in creating the CARES Program (Chemical Abuse Requires Education and Support), a pioneering teacher and peer-driven effort to address student drug use and abuse. He retired from Shorewood in 1989. Mr. Jacobson and his wife had four children. He also has 14 grandchildren and 8 great grandchildren. Nancy Lee (Weeks) Koss was born in Milwaukee, Wisconsin, and attended Atwater School, Shorewood High School, and the Layton School of Art. She was fiercely devoted to her faith and taught Vacation Bible School. In addition, she served on several local charity boards including Junior Achievement Women’s Association, the Boys and Girls Club, and the Milwaukee Art Museum, where she and her husband chaired the Bal Du Lac. Nancy was also member of the Raleigh Tavern Society of Colonial Williamsburg in Virginia and was chosen to screen Wisconsin applicants for admission to West Point. The tennis loving, teenaged Nancy Weeks met the love of her life, John C. Koss, while still attending High School. The couple dated before marrying in 1952. She is credited with helping her husband John birth the Koss Corporation. In 1953 the couple invested $200 to create the Koss Hospital Television Rental Company. The money represented the couple’s life savings and was used to purchase broken televisions to repair, and rent, to Milwaukee hospital patients. In 1958, Nancy's unwavering faith helped create a product that changed the way people listen to music: The World's First SP/3 Stereophone. She was known to bake Royalite earcups for the headphones in her kitchen oven before cooking meals for her husband’s musician friends that gathered to assemble the first SP/3 models. A devoted mother, Nancy Koss had five children in six years, and went on to become a Grandmother to fifteen grandchildren and nine great grandchildren. James W. Meisser is Chairman of a $320 million consolidated asset community bank holding company Lake Shore III Corporation, President and CEO of Hiawatha National Bank with five offices in western Wisconsin and one office under construction in Plymouth, WI and a Director at affiliate bank, Union Bank of Blair. Jim was born in Cleveland, Ohio and the Meisser family relocated to Shorewood, WI in 1962 to enable Jim to participate in a ground breaking Deaf oral education program that mainstreamed him through graduation. Jim graduated from Shorewood High School in 1976 after receiving all-conference honors in football and went on to the University of Wisconsin-Whitewater studying accounting and finance, and playing football for the Warhawks as a four-year starter on defense. After graduating from UW-Whitewater in 1980, Jim embarked on a 25-year career with the Federal Deposit Insurance Corporation, starting as a bank examiner and retiring in 2006 as a Supervisory Financial Analyst. To honor his Mother’s career at the Milwaukee Hearing Society, Jim is a long time board member of Hear Wisconsin in West Allis, WI, a nonprofit focused on assisting families with Deaf children. Jim is an avid golfer and he and his wife reside in Kohler, WI. The 2018 Shorewood Tradition of Excellence honorees were nominated by peers, staff, students, and community members, and selected by a committee comprised of Shorewood graduates, former administrators, and current staff. The Shorewood High School Alumni Association sponsored a special reception for the honorees at Camp Bar from 4:30-6:30 pm, open to Shorewood alumni and community members. Shorewood High School students and staff also had the opportunity to meet the honorees over the course of the day. For more information about the Shorewood Tradition of Excellence Awards, please contact Ted Knight at tknight@shorewood.k12.wi.us.